Cascadia Map #ArtTuesday #AdafruitIO #IoTuesday « Adafruit Industries – Makers, hackers, artists, designers and engineers! A prototype for a Cascadia Map art project using the Adafuit Huzzah controller and Adafruit.io. 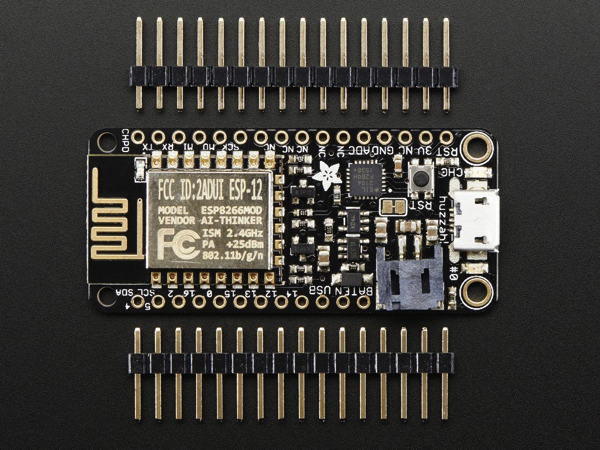 Adafruit Feather HUZZAH with ESP8266 WiFi: Feather is the new development board from Adafruit, and like its namesake it is thin, light, and lets you fly! We designed Feather to be a new standard for portable microcontroller cores. This is the Adafruit Feather HUZZAH ESP8266 – our take on an ‘all-in-one’ ESP8266 WiFi development board with built in USB and battery charging. Its an ESP8266 WiFi module with all the extras you need, ready to rock! Here at Adafruit, we sell all of these amazing components, but we couldn’t find a good way to interact with them over the internet. There are certainly a lot of great services out there for datalogging, or communicating with your microcontroller over the web, but these services are either too complicated to get started, or they aren’t particularly fun to use. So, we decided to experiment with our own system, and that is how Adafruit IO got started. To start, please visit https://io.adafruit.com, and take a look around. You can also visit our comprehensive tutorial located on the Adafruit Learning System. To make it easy for people to get started using Arduino or ESP8266 we have starter packs with just about everything you may want to connect to the internet, with known-working WiFi modules!